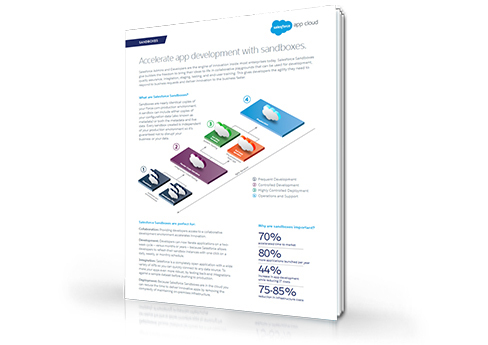 Accelerate app production with Salesforce Sandboxes. Find out how Salesforce Sandboxes can help your developers iterate applications faster in a collaborative development playground that accelerates innovation. Sandboxes are nearly identical copies of your Salesforce production environment and every sandbox is independent of your production environment so it’s guaranteed not to disrupt your business or your data. In this datasheet you’ll learn how sandboxes can be used for development, quality assurance, integration, staging, testing, and end-user training.